This is seriously the BEST CHERRY BREAD EVER!! Ever since I was a little girl sipping on my kiddie cocktail (aka Shirley temple), I would always ask my Dad if he could tell the bartender to add more cherry juice and EXTRA cherries on top of my kiddie cocktail, it was the BEST. And if you have been following my blog for a while, you know that my all-time favorite ice cream is Ben and Jerry’s Cherry Garcia, which inspired my favorite Cherry Chocolate Chip Brownies. 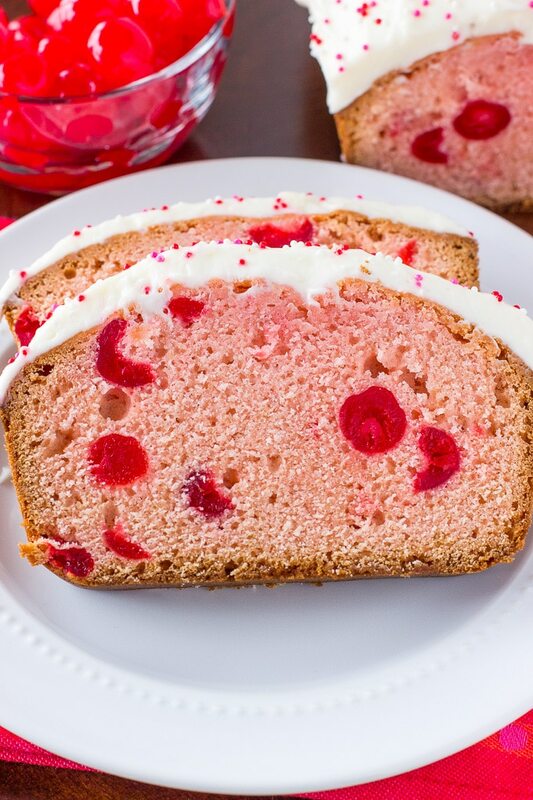 So with Valentine’s Day next week, I couldn’t wait to make another cherry favorite of mine, which is this Sweet Cherry Bread with Cream Cheese Frosting. It’s a delicious, soft, sweet bread filled with maraschino cherries and topped with a light, fluffy cream cheese frosting. 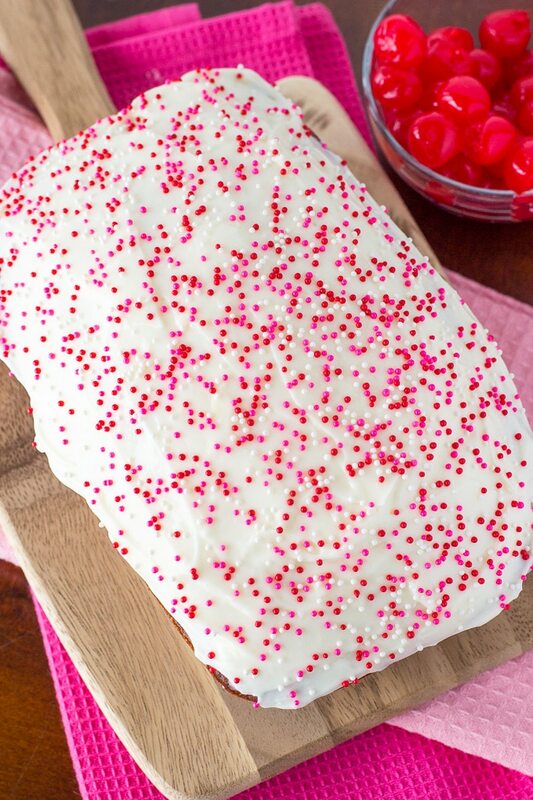 Also to make this cherry bread perfect for Valentine’s Day breakfast or dessert next week, I added some fun SPRINKLES! 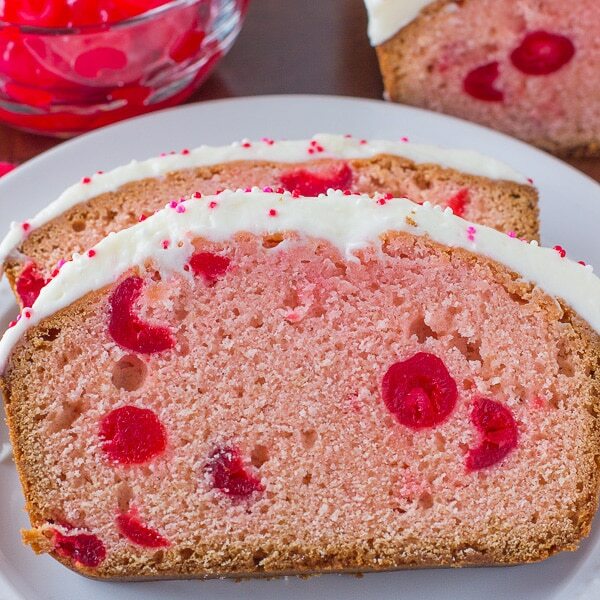 This Sweet Cherry Bread is perfect for the holidays, too! ● ALL-PURPOSE FLOUR: 2 cups of flour. It’s super important to measure the flour correctly. Too much or too little flour can change the consistency of the bread. ● BAKING POWDER: just 1 teaspoon of baking powder. ●SALT: 1/2 teaspoon of salt. ● BUTTER: 1/2 cup of unsalted butter. ● VANILLA EXTRACT: 1 teaspoon of vanilla extract. ● CHERRY JUICE: 1/2 cup of cherry juice from the maraschino cherry jar. ● MARASCHINO CHERRIES: 1 (10 oz.) jar of maraschino cherries. ● CREAM CHEESE: 4 oz. of cream cheese. ● BUTTER: 1/4 cup of unsalted butter. ● POWDERED SUGAR: 1 cup of powdered sugar. ● MILK: 1 Tablespoon of milk or heavy whipping cream. ● SALT: just a pinch of salt. PRE-STEP: Preheat oven to 350F degrees. Spray a 9×5 loaf pan with non-stick cooking spray. Set aside. STEP 1: In a large bowl, whisk together flour, granulated sugar, baking powder, and salt. Using a fork or just your fingers, cut the butter into the flour mixture until crumbly. STEP 2: Add eggs, vanilla extract, and cherry juice to crumble mixture and mix until combined. STEP 3: Fold in cherries. STEP 4: Pour the batter into the prepared loaf pan. Bake for 1 hour and 10 minutes or until a toothpick inserted into the center comes out clean. Let cool completely on wire rack. STEP 5: In a large bowl, using an electric or stand mixer, mix together cream cheese and butter until light and fluffy. STEP 6: Slowly, add powdered sugar and mix until combined. STEP 7: Add milk and mix for about 2 minutes or until frosting becomes light and fluffy. Add a pinch of salt, to taste. STEP 8: Using a knife or cake spatula, frost the top of the cooled bread. Sprinkle with colored sprinkles. DON’T LET THE BREAD BURN: Don’t let the top of your bread BURN! About halfway through baking this bread, make sure to check to see if the top of the bread is getting too brown if it is getting brown just place a piece of aluminum foil over the top of bread for the rest of the baking time to avoid burning the top of the bread. CREAM CHEESE FROSTING: This sweet cherry bread is also great plain without the cream cheese frosting. But I do like that the cream cheese frosting complements the sweetness of the cherry bread making it a perfect combination. And the SPRINKLES makes this sweet cherry bread just so much more FUN! MAKE IT AND FREEZE IT: Lastly, this sweet cherry bread freezes very well. You can freeze this bread up to 3 months but without the cream cheese frosting. 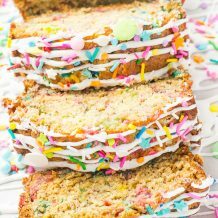 When you’re ready to enjoy let thaw completely, make the cream cheese frosting, frost the top of the completely thawed bread and SPRINKLE with colored sprinkles. BREAD PAN: These are my favorite bread pans. MIXING BOWLS: Here are the mixing bowls, I use almost every day! Preheat oven to 350F degrees. Spray a 9x5 loaf pan with non-stick cooking spray. Set aside. In a large bowl, whisk together flour, granulated sugar, baking powder, and salt. Using a fork or just your fingers, cut the butter into the flour mixture until crumbly. Add eggs, vanilla extract, and cherry juice to crumble mixture and mix until combined. Pour the batter into prepared loaf pan. Bake for 1 hour and 10 minutes or until a toothpick inserted into center comes out clean. Let cool completely on wire rack. In a large bowl, using an electric or stand mixer, mix together cream cheese and butter until light and fluffy. Slowly, add powdered sugar and mix until combined. Add milk and mix for about 2 minutes or until frosting becomes light and fluffy. Add a pinch of salt, to taste. 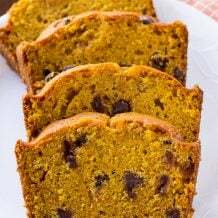 Using a knife or cake spatula, frost the top of the cooled bread. Sprinkle with colored sprinkles. *Store bread covered in the fridge for up to 5 days. Nowhere in the recipe does it state in the ingredients list for the cherry juice or the cherries. Could you please specify as I’m making this recipe tomorrow. I’m so sorry! Our website experienced a technical difficulty, everything should be fixed now. Enjoy and happy holidays! Ok, young lady! 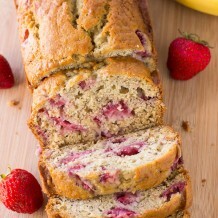 Was only going to look at one recipe on your site for Strawberry Banana Bread and then get busy around the house. It is now almost 2 hours later and I’m still here, looking and saving all your stuff!!! I love maraschino cherries and can see myself eating this whole bread! Love this- it’s perfect for Valentine’s Day! I bet it tastes as delicious as it looks! This bread is so CUTE!! I hope it appears on my kitchen table on Valentine’s Day! I love how pretty this sweet cherry bread is! Perfect for v-day! Love! Pinned! 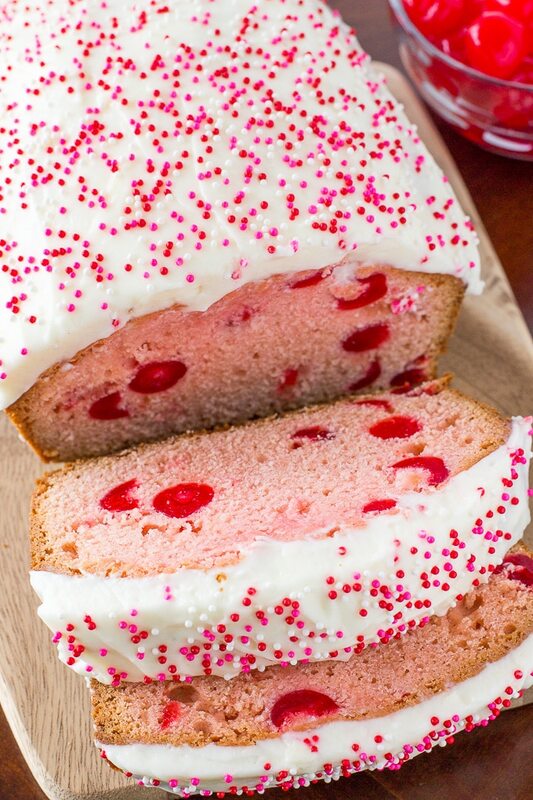 Cherry bread is the best and I love yours with that thick icing and sprinkles! So festive! Such a pretty bread and absolutely perfect for a February treat, Jenn! Pinned! Jenn, this bread is so pretty! I love the idea of it being inspired by a shirley temple! This is just so cute! Looks delicious! Wow – that looks both gorgeous AND delicious!! Pinned! I literally “AWHHH’ED” at how adorable this bread is. The pink and red sprinkles are so festive. 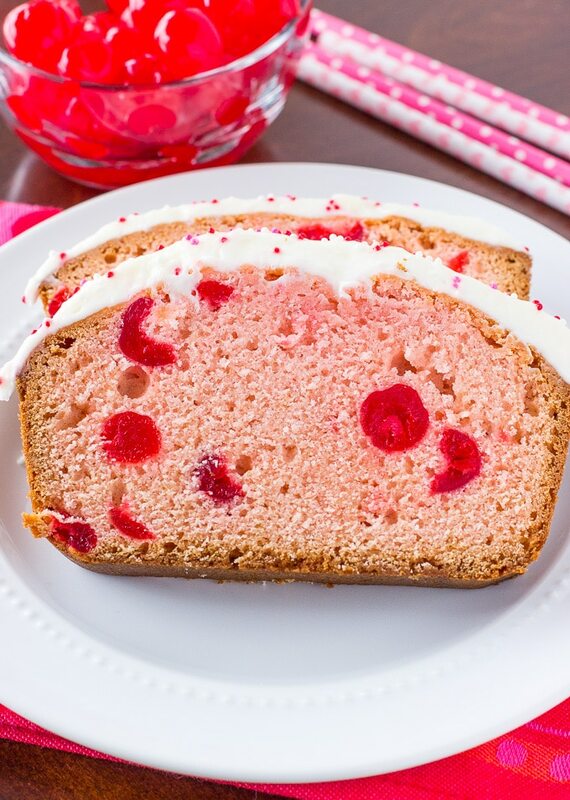 I’ve never had cherry bread before, but this looks divine. I am such a big fan of Valentine’s Day despite the commercialism of it all. I enjoy giving little love notes and sharing scrumptious goodies with my friends. <3 This might have to be on the Galentine's Day menu! I love the pretty pink color of this bread! And I just can’t say no to cream cheese icing. Ever. 🙂 Pinned! This bread is SO pretty! And Shirley Temples are definitely the best mocktails — I still love them!